The Kingdom of Lothere is an ongoing historical fantasy story set in the north of England in the decades following the Norman Conquest. 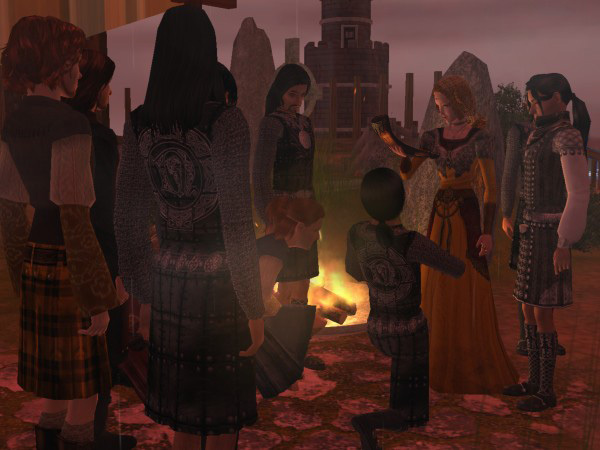 The story is illustrated with screenshots from The Sims 2, and published chapter-​by-​chapter on the Web. In 1066, William, Duke of Normandy, crossed the English Channel and defeated King Harold II of England at the Battle of Hastings. The Anglo-​Saxon nobility all but vanished, either into exile in foreign countries, or into poverty or prison, or death. The Kingdom of Lothere is less a novel than a chronicle of a place and time. Many stories are woven inseparably together. It is also an alternative history of sorts, premised on the ripple effects of the survival of a single man. 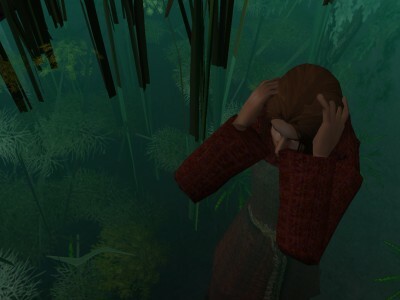 He was supposed to have died at Hastings, but he was saved by the interference of a very unusual raven. The meddling of supernatural beings in the mundane world provides a subtle backdrop of fantasy, as does the existence of two dying races of elves who have little in common with Tolkien’s. The story’s real magic, however, is in its cast of unforgettable characters. If you only want to taste a sample, start in the Storylines Section. There, I have pulled together chapters from some of the individual storylines that run through the larger work. Each storyline is self-​contained and can be read without any prior background. Brief notes summarize important information about events happening elsewhere. Here are a few recommended storylines, but there are many more. “Red Boots” Quick, romantic, and fun, with a tragic twist and a happy ending. If you are interested in the historical context of the story, you can begin by reading “The History of the Hwalas”, which summarizes the previous seventy years’ history of England as well as some background on the Anglo-​Saxon noble families involved in the story. It is not required reading, however.